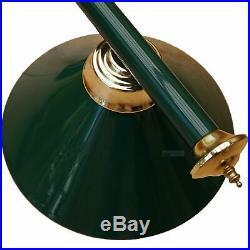 Snooker Pool Table Light Green Canopy Lights. Paul Quidington - Stunning light and so easy to put up, it looks great above my pool table. Silvia Brindle - As advertised. They look great and were easy to fit. Rob Morris - Great pool table light for the man cave highly recommend, Many thanks. Jamie Clarkson - Brilliant for the price. My mates thought it cost me hundreds. Does the job and looks stylish. Leisure Pursuits commissioned a full 48 page EMC test report prior to offering this item for sale some 8 years ago, to ensure that the quality, safety, European compliance and integrity of this light rail is not compromised in any way. This report along with CE and RHOS certification are regularly updated (Copies available on request). 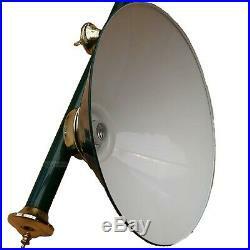 Superior quality green and gold snooker, billiards or pool table light rail to our own specification. The ornate light rail is supplied complete with 3 matching green shades, gold ends and ceiling chain sets. Suitable for all 5ft to 9ft tables. The green shades are solid cold formed steel of a good thickness. Item is a full 38mm diameter x 1mm thick metal light bar, 1.53 metres (60) long and most certainly not to be confused with smaller diameter bars with plastic or thin metal shades. The light rail is fully wired with three UK coloured wire output and two chains for extra stability when fitted. Each of the 3 metal shades has a diameter of 38cm (15) green external coating and white inside to reflect the correct amount of light for enhancing your table playing qualities. 112cm (44) from centre of shade one to centre of shade three i. Also centre line for mounting chains. Max 3 x 60 watt Large ES bulbs or 21w low energy lamps (Not supplied). Mains lead 2 metres long (Most others are only 1.3m). Leisure Pursuits are very much a family business that has been trading since the seventies, with the same family members involved in the daily running of our business. We pride ourselves on offering a friendly and efficient service, along with a great range of quality products at competitive prices. We aim to satisfy or exceed our customers expectations at all times by providing the right product accurately described and pictured at the right price. We have a client base across Europe of over 100,000 customers and we hold large stock levels at our UK warehouse in Plymouth to support our customers. We also fully support and stand firmly behind everything we sell. Why choose Leisure Pursuits as a supplier. Established since 1978 as a 100% owned and run family business. We do not sell any products where we have not been actively involved in the specification process and that we have tested ourselves. All packages are insured so we will never leave you out off pocket. We do not store any credit/debit card or financial information under any circumstances. Your information will be used solely for the pursuits of your orders. DPD Tracked Courier service - This will be a fully tracked service. Our customer services can provided you the tracking information if you wish to track your parcel. Please ensure all orders are checked on receipt for shortages or damage. Carrier will require pictures of damage to packaging or item to enable us to collect and replace for you. Orders received after 3.30pm are dispatched on the following weekday. UK Postal districts such as the Isle of Man, Scottish Highlands, Northern Ireland etc. We will of course allow the cancellation of the order if this is unacceptable to you. Unwanted Item - If you wish to return an item then you may return it to us within 30 days of receipt. The item must be unused, unassembled and with ALL original packaging intact. If damage is suspected the item should either be rejected or signed for as "unchecked". This will allow us to raise a claim and arrange for the despatch of a replacement. Please supply full details of the fault also pictures of the faulty item to help us resolve query to your satisfaction. Please note that some issues may be resolved by supplying replacement parts or alternative solutions acceptable to both parties. We will require you to return the faulty product first at your own expense. Many thanks for looking and happy shopping. Motor Bikes & ATV's. 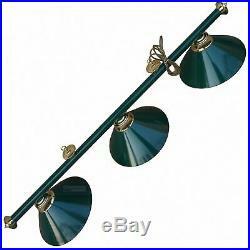 The item "Snooker Pool Table Light Green Canopy Lights" is in sale since Thursday, April 6, 2017. 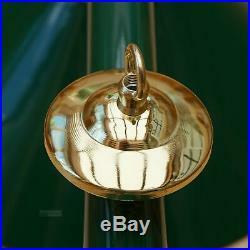 This item is in the category "Sporting Goods\Snooker & Pool\Table Lighting/ Lamps". The seller is "leisurepursuitseu" and is located in Plymouth. This item can be shipped to European Union member countries.